Is This PS3 Exclusive Trolling The Xbox 360? 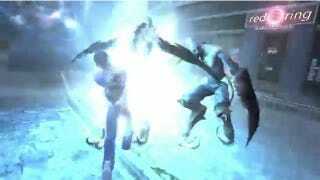 Infamous 2 is a PS3 exclusive. Sony is publishing the game, and it won't be on the Xbox 360. That doesn't mean Infamous is devoid of Xbox 360 references. In the latest trailer, there is an in-game shop called "Red Ring Electronics", which seems to be a reference to the, ahem, infamous Red Ring of Death.